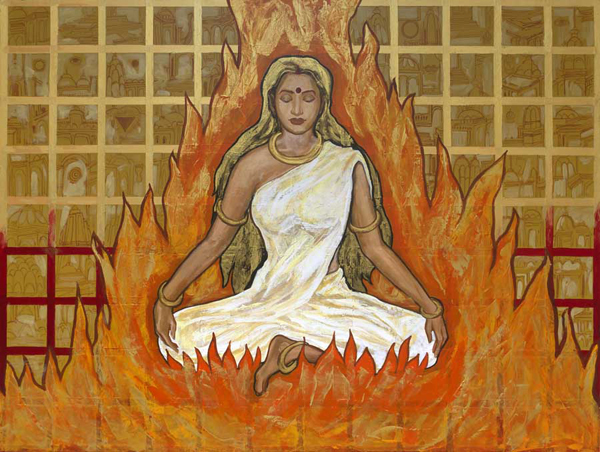 Humiliated and ashamed at her father' impunity, Sati consigns herself to the flames of her father's Yajna Kund. A distraught Shiva awakens to this passionate, impulsive yet selfless love and wouldn't let her body go. Lord Vishnu then used the Sudarshan Chakra at Sati and her body parts were strewn in 108 pieces, and wherever a part fell a Shaktipeeth exists. The 108 boxes in the painting indicate the same.